Together with the amazing audio-team; Patrice Langlois, Nicolas Michel and Emmanuel Puginier, Sound designer Jean-Michel Caron kicks off the world premiere of Cirque’s new production Bazzar in Mumbai, India, running there until December 9th, and in Delhi between December 25th and January 20th. This will be followed by a visit to United Arab Emirates. BAZZAR is an eclectic lab of infinite creativity where a joyful troupe of acrobats, dancers and musicians craft an mind-blowing spectacle. Lead by their maestro, they band together to invent a whimsical one-of-a-kind universe. In a place where the unexpected is expected, the colorful group reimagines, rebuilds and reinvents vibrant scenes in an artistic, acrobatic game of order and disorder. Avid VENUE S6L and Flux:: Spat Revolution Immersive audio engine are proudly part of this fabulous tour, and the BAZZAR production is comprised of Dual Avid S6L Shared IO system with 24 fader control surface together with Avid E6L-144 engine and remote Stage 16 I/O boxes distributed in strategic locations. Spat Revolution is handling multi virtual room for various artistic intend. “The use of Spat Revolution for BAZZAR allowed us to integrate immersive audio content in the show, with travelling audio sources, and at a fraction of what we normally would need to invest to achieve something like this.”, says Jean-Michel Caron. A single virtual room using VBAP panning method is handling 5.1 surround beds delivered to 3 audience zones that gets immersed in the show. A secondary ‘’room’’ is using a selection of loudspeaker (selected arrangement) for the all-around surround experience for virtual source movements and artificial reverberation. A third ‘’room’’ using all available loudspeakers in a arbitrary configuration is as well deployed with KNN panning method to provide the ability to position virtual sources anywhere in the space while keeping the ability to define how many virtual speakers each virtual sources will spread to. Primary and Secondary Mac mini computers are used to execute QLab Cue System and Spat Revolution software on each machines via RME Madi interfaces. While QLab audio cues are played back to console and OSC network cues to Spat , console is sending audio sources to Spat Revolution for real time immersive audio processing and rendered output of the speaker arrangements are then returned to console for distribution to the various FOH Matrix outputs and the various loudspeakers. 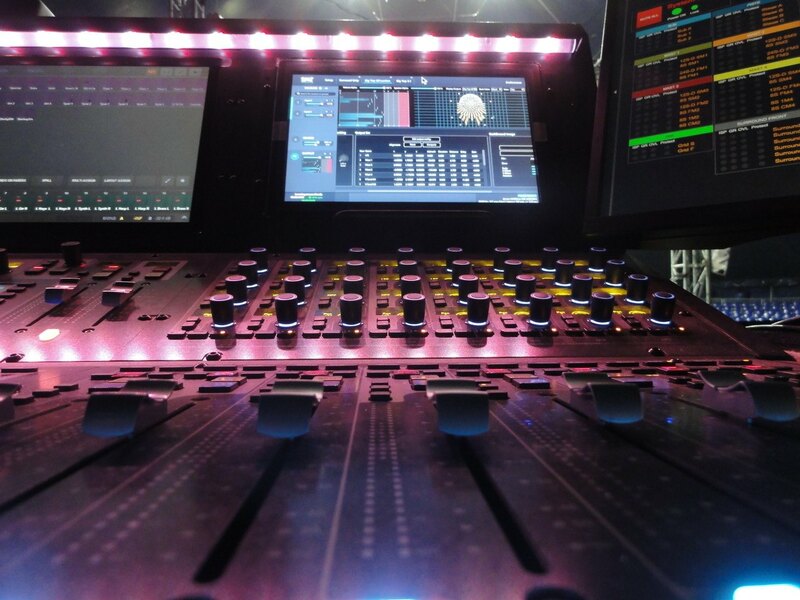 While AVB audio is used for the Stage I/O distribution and the integration of Pro Tools in 128ch mode integration for virtual soundcheck and recordings, MADi interfaces are used on the consoles to patch to the expanded network. The expanded distribution and routing is delivered via Auvitran AVB Toolboxes frames where AES3, Dante and MADI cards are used. Various AVB Toolbox are spread out the big top.